Following an extensive renovation, the gate lodge at Carlowrie Castle is finally coming together. We are also going in for planning for 8 double bedrooms in our stable block, seen in the photo. Like all good Scottish estates, Carlowrie comes with its fair share of outbuildings, some large, some small, some contemporary, some later additions. Set a few minutes’ stroll from the castle, the lodge has privacy, the luxurious interiors you would expect from a Carlowrie property, and architectural significance, having been designed by the same prestigious architect as the castle, all rolled up into a spacious yet cosy chocolate-box-perfect lodge. The lodge comprises three double bedrooms and two smaller rooms ideal for children, with a large communal area and kitchen facilities. It marks a substantial increase in the accommodation capacity of the castle. 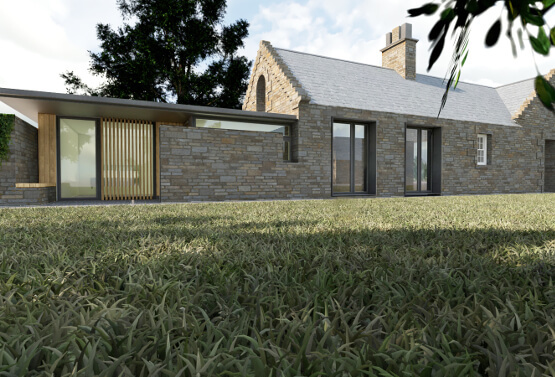 The gate lodge will be ready to welcome its first guests in September.